Delegation: When an object receives a request, the object can either handle the request itself or pass the request on to a second object to do the work. If the object decides to pass the quest on, you say that the object has forwarded responsibility for handling the request to the second object. CRC Cards: Class, Responsibilities, collaborators. Although CRC cards were originally introduced as a technique for teaching object-oriented concepts, they have also been successfully used as a full-fledged modeling technique. Class: represents a collection of similar objects. Responsibilities: something that a class knows or does. Overloading (compile time) and overriding (runtime): The most basic difference is that overloading is being done in the same class while for overriding base and child classes are required. OVERLOADING: Method overloading in Java occurs when two or more methods in the same class have the exact same name but different parameters. Here we have 4 versions of same method “add” which means you’re overloading the method add(). OVERRIDING: An overridden method would have the exact same method name, return type, number of parameters, and types of parameters as the method in the parent class, and the only difference would be the definition of the method. Here speedLimit() method of class lilcar is overriding the speedLimit() method of class CarClass. What do you feel are the benefits to object-oriented programming? Why do you think your change to object-oriented programming is difficult or what makes it difficult for the standard student? These two questions are more subjective so i'll let them be. An object is an instance of a class - it's a concrete 'thing' that you made using a specific class. So, 'object' and 'instance' are the same thing, but the word 'instance' indicates the relationship of an object to its class. Attributes are also data members and properties of a class, they are varaibles declared inside class, they describe the current state of an object. Methods perform operations on objects that alreaedy exist, methods must be declared to return something, although it can be void. This represents the superclass "Shape" which is also an abstract class. You can see it's an abstract class because of the "abstract" before "class Shape". This class also has an abstract method which doesnt have any code inside because every subclass will make use of this method differently. This is a subclass called "Rectangle" of the superclass "Shape" thats why we put "public lass Rectangle extends Shape, to make sure Rectangle is a descendant of Shape. So this is another subclass of the superclass Shape, this time it represents a Triangle and it has a method also called CalculateArea but with a different code than Rectangle because to calculate the area of a triangle is different than to calculate an area of a rectangle so obviously the method has to be different and this is what abstraction is for, to change the inside of the abstract method as many times as we want in the subclasses. Finally, this is the main class. Here we created the Shape "rectangulo" as a new Rectangle so when we use the method calculateArea() it will use the method in the subclass Rectangle and not the one in the subclass Triangle and as you can see it worked. I put 10 and 15 for lenght and width and it showed that the area is 150 which is correct. Then we created the Shame "triangulo" as a new Triangle so when we use the method calculateArea() it will use the method in the subclass Triangle and not the one in the sublcass Rectangle and as you can see it worked again. i put 10 and 15 again but this time for height and base and the area is of course 75 because 10*15= 150 and 150/2 = 75. -Allows the programmer to hide the instance data definition. -Protects the integrity of the instance data. -Hides the methods implementatios, this ensures that data structures and operators are used as intended. What are "has-a" and "is-a" relationships? The has-a relationship means that one type of object contains another or is composed of another. Some examples are: a car has-an engine, a bicycle has-a wheel, and a coffee cup has coffee. Public is the most well known of the Java keywords. Public is also the easiest of the Java access modifiers because of its nature. A variable or method that is public means that any class can access it. This is useful for when the variable should be accessible by your entire application. Usually common routines and variables that need to be shared everywhere are declared public. Private helps to encapsulate your methods and variables most effectively. What do I mean by encapsulate? I mean that only things that should be able to access those methods and variables can do so. There is actually only one way a private method or variable can be accessed: within the class that defined them in the first place. Private variables and methods are those that are meant to be directly accessed by the Java class that owns them. 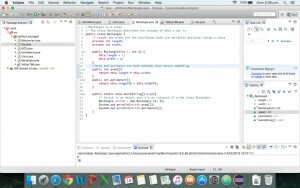 Protected variables and methods allow the class itself to access them, classes inside of the same package to access them, and subclasses of that class to access them. What happens if you do not put any of the Java access modifiers on your methods and variables? Java will still compile your code, so what gives? No access modifier at all means that the method or variable defaults to package protected. This means that only the same class and any class in the same package has access. You get all of the same access as protected minus the ability for subclasses to access the method or variable (unless the subclass is in the same package). What is inheritance and Polymorphism? It allows you to have the same name for a method, but it acts differently based on the class that has that method defined. For example: Animal is a superclass with the speak method and Dog, Cat and Pig are Subclasses of Animal but each one of them speak differently, a Dog barks, a Cat meows and a Pig Oinks which means you have to redefine the speak method for each class depending on how they comunicate. So Polymorphism is saying that it has the same method name (speak) but the actions that are performed are dependent on the class. Special thanks to Luis Vargas, this wouldnt have been done without your help. #TC201 #Topic10 What are visibility modifiers, their purpose and use in practice? A private member is only accessible within the same class as it is declared. A member with no access modifier is only accessible within classes in the same package. A protected member is accessible within all classes in the same package and within subclasses in other packages. A public member is accessible to all classes (unless it resides in a module that does not export the package it is declared in). Access modifiers is a tool to help you to prevent accidentally breaking encapsulation(*). Ask yourself if you intend the member to be something that’s internal to the class, package, class hierarchy or not internal at all, and choose access level accordingly. #TC201 #Topic1 What is an object, attribute and method? An object is an instance of a class, but what is an instance, an instance indicates the relationship of an object to its class, and what is a class, a class is a blueprint which you use to create objects. Attributes are also data members and properties of a class, they are variables declared inside class. Methods perform operations on objects that already exist, methods must be declared to return something, although it can be void.